Brushes that affect the RadDataGrid are shown in the list below. TelerikGridBackgroundBrush: Changes the background color of each cell in the RadDataGrid. TelerikGridForegroundBrush: Changes the foreground color of each cell in the RadDataGrid. TelerikGridBorderBrush: Changes the brush of the borders which separate each cell in the RadDataGrid. 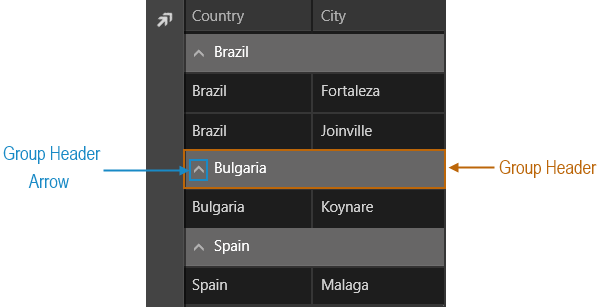 TelerikGridSelectedBorderBrush: Changes the border brush of the selected cell/row depending on the SelectionUnit. TelerikGridSelectedBackgroundBrush: Changes the background color of the selected cell/row depending on the SelectionUnit. TelerikGridPointerOverBackgroundBrush: Changes the background color of a cell/row depending on the current SelectionUnit on pointer over. TelerikGridServiceColumnActiveForegroundBrush: Changes the foreground brush of the Service Column while dragging a column header. 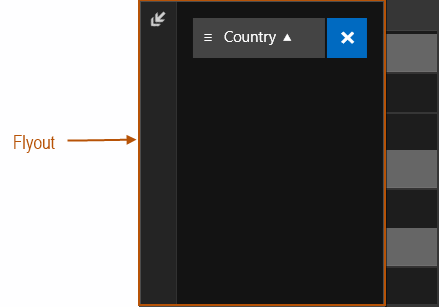 TelerikGridServiceColumnActiveBackgroundBrush: Changes the background brush of the Service Column while dragging a column header. Brushes affecting the Clear Button in the Filtering UI. Brushes affecting the Expand/Collapse Button in the Filtering UI.